There is certainly no shortage of ways to listen to music online. Between Spotify, Pandora, YouTube, or brand new options options like Monstro, which we just covered, users the world over probably already have a preference for where they go to get their online music fix. Loudlee, a brand new web-based option, has just put itself in the running, vying for music lovers’ attention. The Israel-based website, created by Yaron Revah and Guy Elharar, harnesses the power of YouTube to offer users a new and intuitive way to listen to music online. Yaron, the co-founder and CEO, is the same man behind XIV, a company which developed high-end storage systems for enterprises, which was sold to IBM in 2007 for $300 million. So how does Loudlee work? After signing up for an account, using Facebook, you’re met with a page which features the latest artists other Loudlee users are listening to. A static music player sits to the right of the screen, displaying the video for the playing song, and your music will continue to play as you browse the site. You can dive right in and search for artists of your choice. You can listen to an entire album at a time, specific songs, or even any given artist’s most popular songs. While you can add any of the tracks to your playlist, there is currently no way to save it, although this is an upcoming feature. You can keep track of the music you’ve listened to on your profile page, which includes four tabs – Plays, Library, Friends and Followers. 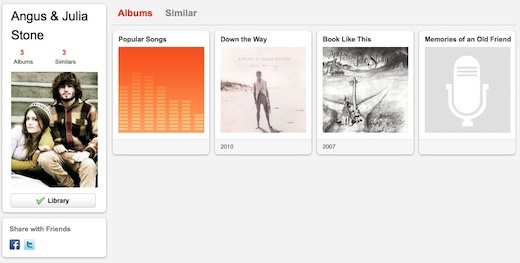 ‘Plays’ displays the specific albums you’ve listened to, while ‘Library’ displays the artists. You can also manually add artists to your library without listening to any songs if you want to build up a collection quickly. Giving users the ability to shuffle through music straight from their library would turn Loudlee into a great way to listen to personalized radio online. Once you listen to an artist, they are automatically added to your profile page, but if you want to remove them, all it takes is the click of a button. Be warned though, there is no privacy feature, so if you have any musical guilty pleasures that you don’t want to share with the public, it’s probably best not to listen to them using Loudlee. Each artist or band page features a list of albums, as well as a tab featuring similar artists, already making it a modest but useful way to discover new music to listen to. While Loudlee is a social network unto itself, allowing you to follow other users, it also allows you to easily share what your listening to through Twitter and Facebook. The site has over 3.4 million songs in its database by 50,000 artists so you’re bound to find something that suits your taste in the huge music library. Because of the way Loudlee works, not only can you find great music to listen to, it has the potential to become a vast online library of your favourite music – provided the videos are still available on YouTube. “We love music and realized a couple of things while trying to listen to music online – one, there are too many obstacles for consuming music online in a streamlined manner – downloading from music stores, uploading to the cloud, syncing multiple devices, not being able to listen to exactly what we want. For each song that is played for the first time on Loudlee, we query YouTube servers (using YouTube’s API) for a list of matching video clips and select the one with the highest rank (our proprietary ranking algorithm takes into account multiple parameters, and is continuously evolving). He goes on to explain that the query will be re-issued if a caching period has expired, if a better version of the song is made available or if the current version is removed from YouTube. Loudlee is also depending on its users to report if a wrong video has been posted, or if there’s a better alternative available. There’s a lot more in store for Loudlee in the future including saved playlists, more social engagement including comments and likes, band pages, radio channels based on song, artist or genre, a suggestion engine for both users and music, and a mobile platform. Loudlee is currently in private beta, but The Next Web readers all have a chance to try out the site for themselves using this link. Of course, in order to sign up, you’ll have to grant Loudlee access to your Facebook account, but it only requires access to your basic information.